We try and eat healthier and with a name like that I immediately thought this company goes into a lot of detail and tried to be as eco conscious as they can. I was so excited to try their sampler kit of revolution foods. It had Mashups (2 in each flavor) Grammy sammy's which were graham cracker and yogurt sandwiches and the Jammy Sammy's which were peanut butter and jelly. Avery seemed to like them all. All of them were gone within a week. She was loving the foods and was so happy with them. I of course tasted them all and they were yummy to me as well. I would've eaten them if by some weird chance she didn't like them, but that of course was not the case. 100% organic fruits in a fun and kid friendly packet. Making them not only great tasting, but east to use and no mess. There are no Trans Fats, No High Fructose. They come in the perfect squeezable pouches that are just the right size for travel, lunch boxes, picnics, diaper bags, and for your stroller. Graham & yogurt together in a fun, yummy size and cute shape. 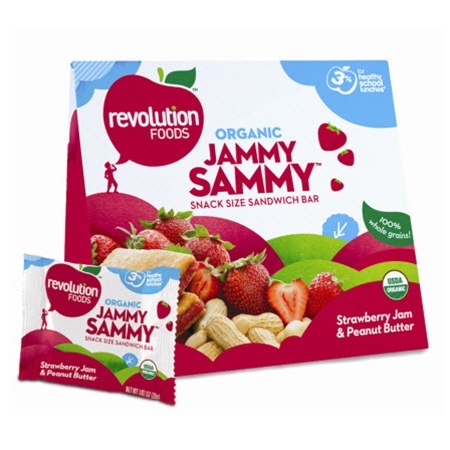 Jammy Sammy healthy snacks are easy for little hands to carry and even easier for traveling. I love that these yummy healthy snacks are perfect does of whole grains and energy. While out running errands and I need a snack powerful yet healthy enough to hold my kids over until we get home, Sammy Jammys are the perfect option. EcoMom is excited about their NEW program~ EcoPass. This allows you to purchase $99 dollar annual membership, which provides for a 15% discount on every order, as well as free shipping with no $75 minimum requirement. Overall: ***** So happy with these and I'll be sure to purchase from them in the future. I'd love to try the CleanWell Starter Pack. I would love the Boon Squirt Spoon for on the go feedings. I also like the Under the Nile Training Pants! I like the Under the Nile Fruit and Tote toy. I'd like to try the Pasta with Chicken & Veggies Training Meal. My daughter is a really picky eater it's hard to get a balanced meal in her! I like the new boon potty seat and stool. I love love love the plum organics foods! I like the banana fiddlesticks. I get the ecomom newsletter. Pasta with Chicken & Veggies Training Meal.